Buckle up for a massive night of Supercars racing action! Sydney’s only round of the Virgin Australia Supercars Championship is going to be better than ever, under lights! Get your mates together and enjoy a super night out! Buy a Grandstand four-pack and save $70. Plus receive a free glow in the dark lanyard and ticket pouch for patrons that purchased a grandstand ticket on or before the 6 July 2018. 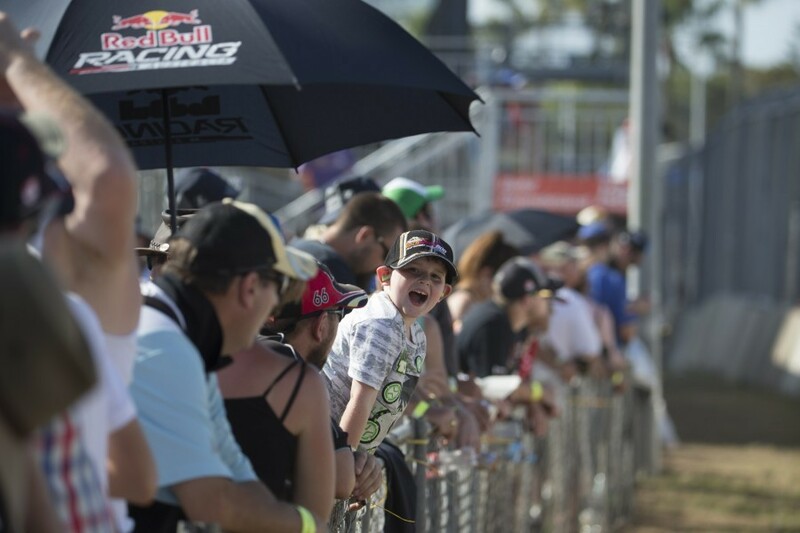 This year, a family trackside package entitles you to four Trackside tickets (2 adults, 2 kids) and gives you free paddock access and rooftop viewing. Kids will also receive a celebratory light up kids klapper, so they can cheer on their favourite driver, but only if you're one of the first 1000 packages sold so get in quick. Round up the family for a fun day out and save $40! This package entitles you to 4 seats in the under-cover Grandstand (2 adults, 2 kids). The perfect place to soak up all the action from the best seats trackside. Friday will see support categories heating up the track before Supercars battle all Saturday into the night for an unbeatable racing experience. For Friday only, there is one ticket option which gives you ultimate access including Unreserved Grandstand seating, Paddock entry, Trackside roaming and Rooftop viewing. All this for $20! For those fans who want to wander around the circuit and soak up all the colour and atmosphere of this exciting new event, a Trackside ticket is the perfect option for you. The Sydney Motorsport Park Track has plenty of space and for 2018 rooftop access is included in in your event ticket! So, bring your chair and you blanket and get ready for a great night of Supercars racing. Take the comforts of your car to the track with Trackside Parking at the Red Rooster Sydney SuperNight 300. Trackside Parking enables you to park your car close to the track, located just after turn 11 heading on to the main straight. Trackside Parking is strictly limited and has sold out in previous years – get in quick to secure your spot! Only one Trackside Parking ticket is required per car, however each person in the car must have a valid event ticket. For the most comfortable trackside experience, this ticket option is perfect for you. Unreserved Grandstand seating that is under-cover, protecting you from the sun and rain. It features great viewing along pit straight and close to the Big Screen, food stalls and toilets. Kids 12 and under receive free Trackside admission with a paying adult. With plenty of action on track there is something for all kids big and small. Ticket prices above do not include the Ticketek fees. A service & handling fee includes a one-off fee of $7.95 per transaction on all purchases. Ticket orders purchased by credit/debit card are subject to credit/debit card approval and customer account verification. Concession includes full time students, seniors, pensioners and patrons with disability cards. Please enter the Park and View Area via Gate B off Peter Brock Drive. All vehicles must adhere to a strict 10Kph speed limit. All vehicles will undergo a full search before entering. Each vehicle requires a Trackside Parking Ticket. Each patron requires an Entry Ticket in addition to the vehicle’s Trackside Parking Ticket to gain entry into the Event Precinct. No Glass or Alcohol is permitted into the Event. Limited front row viewing for first row of customers only – first in first served. All vehicles must be passenger vehicles only – no caravans, trailers, trucks or motorhomes. One BBQ per site only – only within the designated BBQ area on the hard stand (gravel area). A BBQ site is not guaranteed when booking a Trackside Parking ticket – sites are available on a first in basis. Only personal amounts of food are allowed into the venue via Trackside Parking gate. You must follow all directions from parking staff members. Trackside Parking areas will be opened and closed at the discretion of Supercars. Bad weather may cause some Trackside Parking to be closed. Kids 12 and under are permitted free access to the event when accompanied by a paying adult. Kids 12 and under are not permitted into the Grandstand or Corporate areas without a valid Grandstand or Corporate ticket. Kids 3 and under can sit on their parents lap for free in the Grandstand. Kids 4 and over require a Grandstand ticket to access the Grandstand.